One Microphone Kit for Every Drum Kit! Covering all your drum miking bases, the Audix DP7 drum microphone package puts seven instrument-specific mics at your disposal so that your drums come through loud and clear, both on stage and in the recording studio. The DP7 kit includes everything you need to outfit your drum kit: microphones for capturing kick drum, rack toms, floor tom, snare, and overheads; easy-to-position mic clips; and a protective road case for toting your precious miking cargo. The Audix DP7 is your all-in-one kit! In the box, you have Audix's flagship D6 kick drum mic, two D2 microphones for rack toms, one D4 for floor tom, the i5 for snare, and a pair of ADX51s for overhead miking. Four D-Vice rim mount clips are included for the snare and tom microphones, and three heavy-duty tension fit mic clips are provided for the other three microphones in the DP7 package. 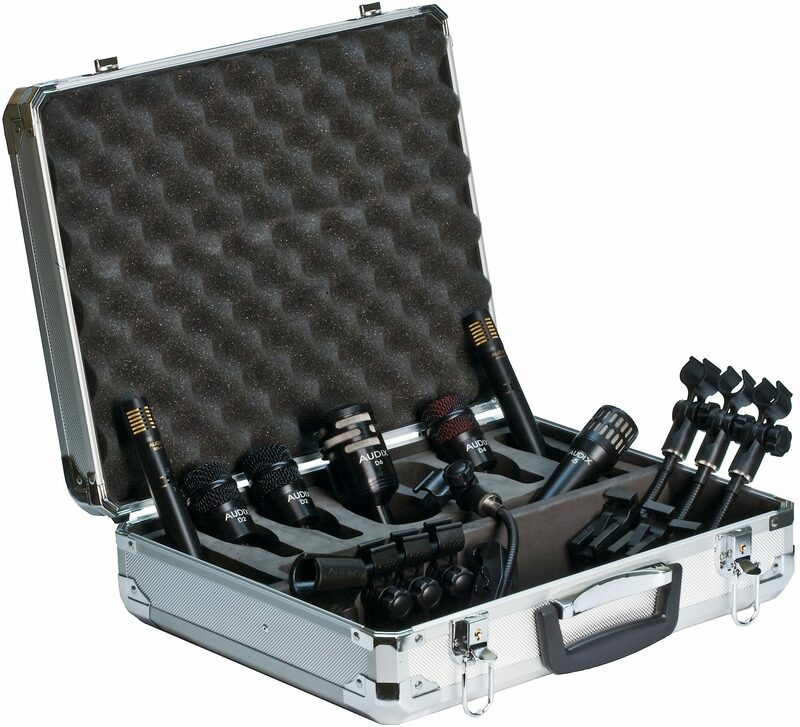 Ensuring safe travels no matter where you go, all mics and clips are packaged in a foam-lined aluminum carrying case. A modern classic mic on bass drum, the D6 kick drum microphone is specially designed to sound great in any position. Its tailored frequency response of 30 Hz to 15 kHz, as well as its cardioid pickup pattern, fills the bill for capturing hard-thumping kicks. If you're recording or reinforcing rock or pop drums, the Audix D6 is simply a must-have mic. Able to capture the snare's rich, deep resonance and biting attack, the i5 microphone features a cardioid polar pattern, a smooth and uniform frequency response of 50 Hz to 16 kHz, and high SPL handling in excess of 140 dB. Because the i5 is a cardioid mic, it can give its full attention to the snare or other instrument being miked while rejecting other instruments or ambient noise on the sound stage. When you're not using it on snares, try the i5 on percussion, guitar cabinets, and vocals. The DP7 package includes two D2 microphones, which accurately reproduce the warmth and natural overtones of toms or congas, without sounding too harsh. According to Audix, the D2 requires very little, if any, EQ, and no gating is needed because of the D2's tight hypercardioid polar pattern. The D4 mic provides an additional octave of low end response beyond the D2, so your large toms and other bass-heavy instruments come through cleanly. Characterized with a flat linear response of 40 Hz to 18 kHz, the D4 is quite versatile when it comes to capturing instruments with extended bass. Capture the high-end sparkle of your drum kit with this pair of ADX51 microphones on overheads. Designed for miking cymbals, high-hat, and acoustic instruments, the Audix ADX51 is a pre-polarized condenser mic offering extended highs, superior imaging, high SPL capabilities, a -10 dB pad, and a bass roll-off filter. The D6 has a frequency response of 30 Hz - 15 kHz and is characterized with a cardioid pickup pattern. The D6 is designed to sound good in any position and it is not dependent on finding the "sweet spot" of the drum. The D6 capsule features the same legendary VLM technology that has made the D series percussion and instrument microphones very popular for today's live stages and recording studios. The i5 has the ability to capture the rich, deep resonance of the snare along with the attack necessary to cut through the mix. The i5's cardioid polar pattern allows it to focus on the specific instrument that is being miked while rejecting other instruments or ambient noise on stage. With a smooth and uniform frequency response of 50 Hz - 16 kHz and an ability to handle sound pressure levels in excess of 140 dB, the i5 can be also used for a wide variety of instrument applications including percussion, guitar cabs, and vocals. For bringing out the real, dynamic sound of toms or congas, the D2 cannot be beat. The D2 accurately reproduces the warmth and overtones of the instrument without sounded harsh or boomy. The very natural, articulate D2 requires very little (if any) EQ, and because of its tight hypercardioid polar pattern, no gating is needed. The D4, which provides an additional octave of low end response beyond the D2, is the perfect companion for large toms and other instruments characterized with extended bass frequencies. In fact, the D4 responds down to below 40 Hz, a remarkable feat for a microphone of the this size and performance. versatility. The D4 is characterized with a flat linear response from 40 Hz - 18 kHz, making it the most versatile of all the D-series microphones. The ADX51 is a pre-polarized condenser microphone designed to handle nuances of recording as well as the rigors of live sound. Characterized with extended highs, excellent imaging, and high SPL capabilities, the ADX51 can be used for cymbals, high-hat, and acoustic instruments. The ADX51 also features a -10 dB pad and bass roll-off filter, making it extremely useful for a wide variety of applications. "Audix DP7 Drum Mic Package"
Sound: Exceptional! Ease of Use: The included clips for putting the mics on the drums are solid and easily adjustable. Quality: Very solid feel. Manufacturer Support: Haven't had to use them. The Wow Factor: They have a high quality look to them and feel very solid. Overall: Seem very well built. Nice that the case comes with extra slots if I need to expand. Switchable Low cut filter and and pad on overheads very useful. Easy to level set and everything worked right the first time. The drummer for one of my bands has this set and as the sound guy I am very impressed with the clarity and lack of bleed through from this mic set. I needed drum mics for my other band and I had no hesitation in getting the Audix Mics. Style of Music: Currently with a Pink Floyd tribute band and a Rock and Roll cover band. Overall: These microphones exceeded my expectations especially since I have used Shure, Sennheiser, AKG, and Audio Techinica mics for many years, these mics offer a new twist on the old workhorses.